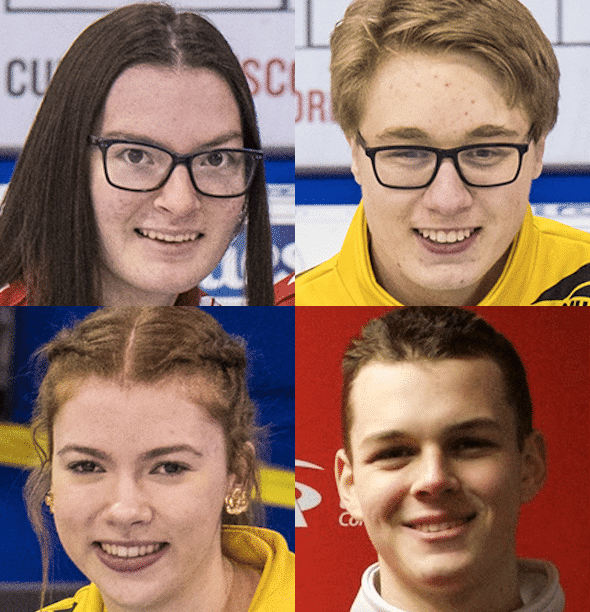 Clockwise from top left, Emily Deschenes, Jaedon Neuert, Nathan Young and Lauren Rajala will represent Canada at the 2020 Youth Winter Olympics in Lausanne, Switzerland. Emily Deschenes of Greely, Ont., Jaedon Neuert of Winnipeg, Lauren Rajala of Sudbury, Ont., and Nathan Young of Torbay, N.L., will wear the Maple Leaf in the third Youth Winter Olympics, which are scheduled for Jan. 9-22. The curling venue is in Champéry, Switzerland, which has hosted numerous international curling competitions over the years. Applications were accepted from all age-eligible players in Canada (players must be born between Jan. 1, 2002, and Dec. 31, 2005), with the focus on participants in the 2019 Canada Winter Games in Red Deer, Alta., and the 2019 Canadian Under-18 Boys and Girls Championships in Sherwood Park, Alta. Athletes were assessed based on their curling skill, community leadership and academic achievement, and were also asked to submit a 500-word essay outlining why they wanted to play in the Youth Winter Olympics, and how it could impact both their own curling ambitions as well as curling development in Canada. Radford also coached Canada’s teams at the first two editions of the Youth Winter Olympics. In 2012 at Innsbruck, Austria, Canada’s team of Thomas Scoffin, Corryn Brown, Derek Oryniak and Emily Grey claimed a bronze medal, while in 2016 at Lillehammer, Norway, Mary Fay, Tyler Tardi, Karlee Burgess and Sterling Middleton won gold. All four players are 16 and are completing Grade 11 studies in their respective schools. Positions for the players haven’t been assigned, and will be determined following upcoming training camps leading to the Games. Rajala, who curls out of the Idylwylde Golf and Country Club, is coming off an amazing season that saw her win gold (for Team Ontario) at both the Canada Winter Games and (for Team Northern Ontario) at the Canadian Under-18 Championship, throwing lead rocks for Bella Croisier’s team. She attends Lasalle Secondary School, and carry’s a 95 per cent average. Deschenes, meanwhile, skipped Team Ontario to a silver medal at the Canadian Under-18 Championships. She plays out of the Manotick Curling Centre (near Ottawa) and has an 84 per cent average at John McCrae Secondary School. Neuert, representing the St. Vital Curling Club in Winnipeg, won bronze at the Canadian Under-18 Championships as the vice-skip for Jordon McDonald’s Manitoba team. He is a 90 per cent student (in French Immersion) at Collège Jeanne-Sauvé in Winnipeg. Young skipped Team Newfoundland/Labrador to a fourth-place finish in the Canada Winter Games. A Grade 11 student at Gonzaga High School, Young, who curls out of the RE/MAX Centre in St. John’s, carries a 96 per cent average in French Immersion studies. Twenty-four countries will send mixed teams to the 2020 Youth Winter Olympics; the competition format will be announced at a later date. Once the mixed team event is done, the players will then be formed into mixed doubles teams, matching players from different nations, for another competition that will conclude the Games.